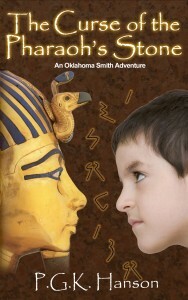 The Curse of the Pharaoh’s Stone is about a boy who made an angry wish that his twin brothers would disappear—and then they and his mother died. Now, 12-year-old Okie believes that his wish, combined with a mysterious ancient Egyptian tablet in his possession, killed them and cursed the family, sabotaging everything they have tried to do in the four years since. He obsesses over the strange writing on the tablet, thinking that if he can decipher it he can undo the curse. In his quest to decipher the stone, Okie learns that someone else wants the stone—an Englishman who would kill anyone who gets in his way. The tablet is “the key to life and death,” the Englishman says. While seeking the truth of the stone, Okie must save his best friend from kidnappers, outwit the Englishman, and break the curse on his family before someone else dies.